Ask Leo! #652 – What Good is Incognito Mode? The doors to Allen Wyatt's Excel Macros for Beginners course close on Thursday the 18th. If you're at all on the fence, you have until then to sign up. Either way, the free videos are free and worth checking out. I use incognito mode in my web browser to keep my online activities private. I mentioned that to a friend and he said it wasn't private at all. If he's right … what's the point? You're both right, and you're both wrong. Incognito mode in Google Chrome, also referred to as "Private" or "InPrivate" in Firefox, Internet Explorer, Edge, and other browsers, protects your privacy to a point. It's critical to know where that is, because beyond that point, Incognito does exactly nothing to keep you more private. Entering Incognito mode varies based on browser, and there are multiple ways, but in Chrome, click on the ellipsis menu at the right end of the menu bar, and click on "New Incognito Window". The history of files you've downloaded within Incognito windows (though the files themselves are left intact). Cookies left by the sites you've visited within Incognito windows. Any normal, non-Incognito windows are unaffected. Your network traffic is unaffected. Your ISP can still see what you're up to. The websites you visit have no idea you're incognito. They can still identify you by various means not limited to cookies, and they can still keep a record of your visit. Any malware on your machine can see what you're up to. It certainly shouldn't be considered as any kind of absolute privacy or security tool. Related Links & Comments: What Good is Incognito Mode? At least, that's the way it seems, sometimes. One way I've solved that for myself is to make use of some of the time I spent on the road, or even just working outside: listening to audio-books from Audible. One of my favorite "listens" in recent months is "The Book Of Joy". 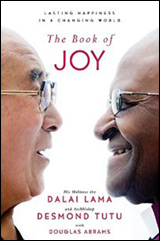 It recounts the meeting of Desmond Tutu and the Dalai Lama in honor of the later's milestone birthday. As the description states, "...they are also known for being among the most infectiously happy people on the planet." Who couldn't use a little additional happiness these days. In a completely different direction, I'm currently listening to the first book in Stephen King's The Dark Tower series, in preparation for the movie coming out later this year. If you're as strapped for time as I am, consider an Audible book, or even a monthly subscription. There are just so many great titles out there, it's a great way to make use of what might otherwise be "down time". Turns out it wasn't Windows, per se, but Windows Defender (and Microsoft Security Essentials, in prior Windows versions). And "crazy bad" is apt. It set into motion an example of "the system" working, and working well, to keep you safe. Looking at a book online it said: "At the Publisher's request, this title is being sold without Digital Rights Management Software (DRM) applied." – What's that about? DRM, or Digital Rights Management, is software that prevents you from copying digital purchases and giving them to others. Naturally, it's complicated, and can be used for more fine-tuned control, but put another way, at its core it simply prevents theft of copyrighted material. Unfortunately, it's rarely bullet-proof, and in doing its job, it's the innocent who pay the highest price. Continue Reading: What Is DRM? I'll be visiting Fairbanks, AK (or, more precisely, Girdwood), this weekend to help out with amateur radio support for Bike MS, Alaska, to benefit The National Multiple Sclerosis Society. If you're in the area, drop me a line!